As a solar-powered technology fabricated from stainless steel, the LumenAER also reduces the overall aeration cost and withstands temperature variations and harsh water quality. These aerators provide gentle mixing, delivering just enough oxygen in the water to prevent algae growth and fish kills. The pond is less likely to “turn over” in the spring and fall. A lower algae level makes the water easier to prepare as a reservoir for distribution into potable drinking water systems. Fluence offers four different LumenAER design models, each using sources of power tailored for any application. Each model is recommended based on solar availability, primary flow loads, pond depth, and the recommended daily mixing duration. The Sunup-to-Sundown (SS) model uses solar power exclusively. The SS model benefits lower organic loads and longer detention times. Both the Solar/Electric (SE) and Solar/Battery (SB) models provide year-round continuous aeration, using a backup power source to the primary solar system. The SB model functions best in geographic locations which have limited access to natural sunlight for more than six hours per day. These models can run as long as 48 hours on battery alone. The Low-Energy Mixer (LEM) is a non-solar model operating at approximately 120 watts of power at 110 VAC; Fluence has also designed it for ponds with a high organic load and short detention. All LumenAER models run on less than 120 watts. A single, solar-powered unit can save about 3.6 kilowatts of energy per day, or about 1,300 kilowatts annually. This energy savings, along with avoiding the construction of an expensive utility infrastructure to provide power to remote areas, and a reduction or elimination of expensive chemicals to treat algae and prevent odors, provides a more cost-effective solution with a short return on investment timeframe when looking at the total cost of ownership. In addition, companies who purchase solar-powered models can take advantage of local, regional, and national rebates. How Does the LumenAER Work? The LumenAER circulator lifts oxygen-deficient water from lower layers and spreads it on the water’s surface, creating an aerobic cap: a layer of water on the pond’s surface that works with the atmosphere to improve digestion of soluble biochemical oxygen demand (BOD) and accelerate digestion of semi-soluble BOD. This process also stimulates the digestion of solids and minimizes odors typically found in stagnant water. 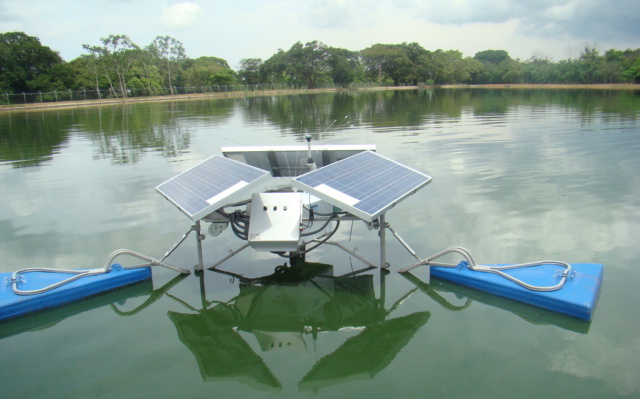 The LumenAER continually recycles and provides destratification to reservoirs, lakes, and ponds simultaneously from multiple depths. The circulation technology also restores oxygen to the lower levels, which improves the overall water clarity and quality. At Fluence, our applications engineers are devoted exclusively to helping treatment plant operators, consulting engineers, and contractors worldwide. With decades of expertise and best-in-class aeration technologies, our experts can help you find the right water circulation solution for your unique challenges. Contact Fluence for more information about our low-energy LumenAER, leasing options, or to request a quote. Contact Fluence to learn more about our water and wastewater treatment solutions, or to discuss your specific project details.